Indicates health of the ecosystem: Eelgrass bed extent and health serve as an indicator for water quality and overall ecosystem health. Provides information on a key habitat for fish: Since eelgrass beds are important habitat for many fish species, monitoring eelgrass is an important element of fisheries management. Helps managers balance natural and human uses: In its coastal permitting oversight role, the RI Coastal Resources Management Council requires certain activities, such as building and dredging, to avoid and minimize impacts to eelgrass and other submerged aquatic vegetation. Monitoring helps determine if and what precautions may need to be taken. 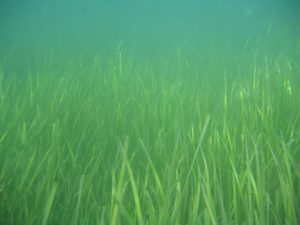 Eelgrass is a flowering plant that is rooted in the soil and grows in shallow waters approximately three to twelve feet deep and provides critical habitat for numerous fishes and invertebrates, including juvenile salmon, crabs, herring, shellfish, and more. In turn, these species supply food for humans and wildlife. In addition, eelgrass helps prevent erosion by stabilizing sediments, buffers the shoreline from the impact of waves, traps sediment particles suspended in the water, and reduces pollution by using excess nutrients such as nitrogen and phosphorus, removing them from the surrounding water column. Eelgrass is sensitive to changes in nutrient and light levels, and is a good indicator of environmental change. In the late 1800s, Narragansett Bay was teeming with eelgrass. In the 1930s, an eelgrass wasting disease hit North America and Europe and devastated eelgrass on the Atlantic coast, destroying 90% of Rhode Island’s beds. Since then, hurricane damage, nutrient pollution, algal blooms, and other impacts have prevented eelgrass from returning to historic levels. In recent years, efforts to protect eelgrass have shifted from restoration of eelgrass beds through new plantings to fostering the natural expansion of eelgrass beds through improving water quality. Monitoring and mapping efforts evaluate changes in existing eelgrass beds. There is evidence of rejuvenation of eelgrass beds in Narragansett Bay, and some scientists credit improvements to water quality as the driver for this positive biological response. 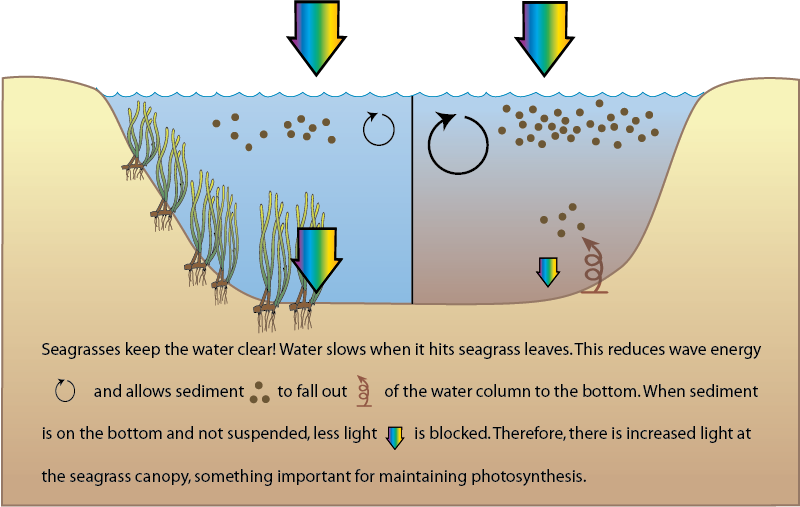 Eelgrass helps trap sediment that is suspended in the water column, which keeps the water clear and allows the eelgrass to get more light. Image courtesy of Teach Ocean Science Website, Integration and Application Network, University of Maryland Center for Environmental Science.